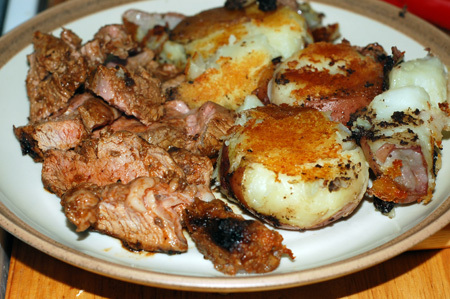 This meal wasn’t anything particularly unusual for us, just a marinated butterflied leg of lamb that I grilled and served with smashed potatoes. The marinade this time was a delicious blend of tomatoes, garlic and Mediterranean spices. (Sticking with my pantry, I went with ordinary canned tomatoes, minced garlic, and za’atar, rather than San Marzanos, garlic confit, and sumac.) The potatoes were a variation of my favorite recipe, just incorporating a bit of tapenade, which I thought might be a good way to acclimate myself to the flavor. Not so much: I personally thought it ruined the potatoes entirely, and I am no more inclined to sample tapenade again. The real story of this lamb came a day or two later, when I decided to serve the leftovers stuffed into pita with a simple garlicky yogurt sauce. The problem? We didn’t have any pitas, so I made some instead. My main concern was obtaining the famous pocket in my pitas, a trick which requires a hot oven and just the right thickness and moisture balance. 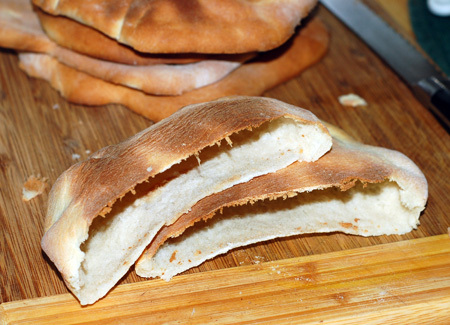 In the end, not all of my pitas puffed, but there were enough to serve with our remaining lamb. 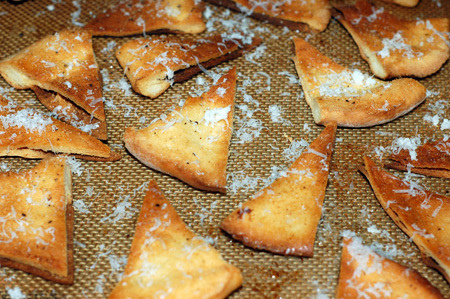 As for the pitas that didn’t puff, I made them into baked pita chips to accompany a bowl of tomato cream soup. I cut them into 8ths, brushed them with a combination of melted butter and oil, and sprinkled them with a bit of salt, pepper, and garlic powder. They baked at 375F for 10-12 minutes, just until they crisped up and began to brown around the edges. I shredded a bit of Parmesan over top for a finishing touch. Place 1 C flour into the bowl of a stand mixer, along with the other dry ingredients. Add the oil and hot water, and blend at low speed with the paddle for 30 seconds; increase to high speed for 3 minutes. Switch to the dough hook and add the remaining flour 1/2 C at a time, until the dough is a rough, shaggy mass that clears the sides of the bowl. Knead for about 6 minutes by hand or with the dough hook. Preheat the oven to 500F. Divide the dough into 8 equal pieces. Roll into balls, cover with a towel, and allow to rest for 20 minutes. With the palm of your hand, flatten each ball into a disk. Finish with a rolling pin, flattening each portion into a round about 6″ in diameter and 3/16″ thick (the thickness of a wooden yardstick). This thickness is important for the eventual puffing of the dough. Place each round on a square of aluminum foil. Place 2 or 3 pitas, with their foil plates, directly onto the oven rack, and bake for about 8 minutes, or until they are puffed (or set and lightly golden). 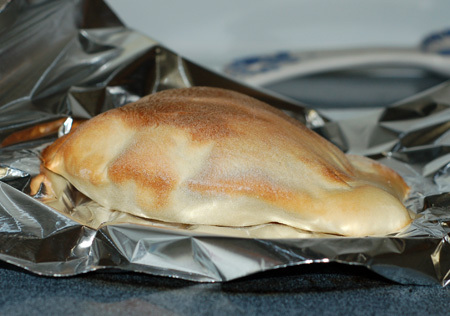 Remove from the oven and enclose in a foil packet; the steam heat will soften the pitas and allow the pockets to collapse. Source: New Complete Book of Breads, by Bernard Clayton.